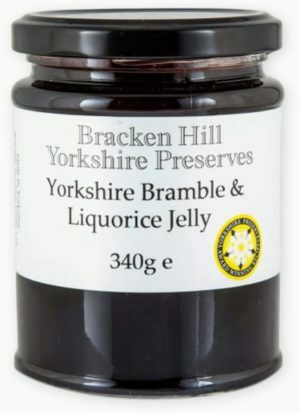 Made for Wakefield and Pontefract Liquorice Festival this popular jelly has proved a winner all round. Great with game, lamb and also as a sweet treat. Love ,Love, Love it great lover of the original pontefract cakes ,this jam has the subtle taste of them ,now it’s jam with everything. We bought ours at the Burton Constable Hall craft fair on Sunday – today is Tuesday and we are ordering more …. it is awesome ! I love the flavours but couldn’t quite imagine them together … it is beautiful and I need more !!!! Excellent just on warm toast but is great for making sauces for game meats. A must for liquorice lovers. Sugar, Blackberry Puree 35%, Lemon Juice 5% (From Concentrate), Liquorice 1%, Gelling Agent: Fruit Pectin, Liquorice Flavour, Citric Acid, (Prepared with 40g Fruit per 100g. Total sugar content 67g per 100g).